So, it’s been a while. I definitely regret that I haven't been able to blog for some time, but it’s also allowed me to do some pretty cool things in the meantime. I went back home for the summer (July-August) to spend some extended time with my family and go on a family vacation together. I miss them so much during the year that this trip was exactly what I needed. We went camping, spent a week on Nantucket and I got to unplug from the rest of the world. It was glorious. Plus, Edoardo actually came with me this time and we got to spend a few days in NYC with my best friend. He absolutely loves the city so it was great to be with him there enjoying it. When I got back, I started a new job at a real estate agency in Rome that sells Italian property to foreign buyers. It’s my first job not teaching English in Rome and it was such an exciting step for me. I studied communications in college and always imagined I’d be doing PR or social media when I graduated so it’s somewhat of a dream come true. I’m doing all of its social pages, writing real estate descriptions in English and Italian (!!) and making newsletters, presentations, and other graphic-related projects as well. Not to mention it’s located in an absolutely beautiful area of Rome so I get to look at ancient buildings on my commute and walk down cobblestone streets on my way to lunch. I’m also working as a freelancer, doing website development, social media, and English lessons on my off days so it’s a really rewarding and constantly changing schedule. I’m still getting used to everything but so far I’ve really been loving it and it’s been such a refreshing change from the past two years of teaching in schools. I had to go back to the U.S. for family-related reasons in September so I got some bonus time there. And my boyfriend and I have been dealing with other health-related crises over the fall so although traveling has been off the table, we’ve been able to spend a lot of time in and around Rome, having weekend lunches with his family and buying new plants to spruce up our apartment. With Edoardo’s family and several American-food loving friends, I celebrated my third Thanksgiving in Rome. It’s bittersweet because I miss being home every year but it’s also so fun coming up with ways around Italian food limitations and seeing the look on my friends’ faces when I serve them marshmallow-covered sweet potato casserole alongside turkey (Italians DO NOT mix their sweet and salty—desserts go at the end of the meal, always). 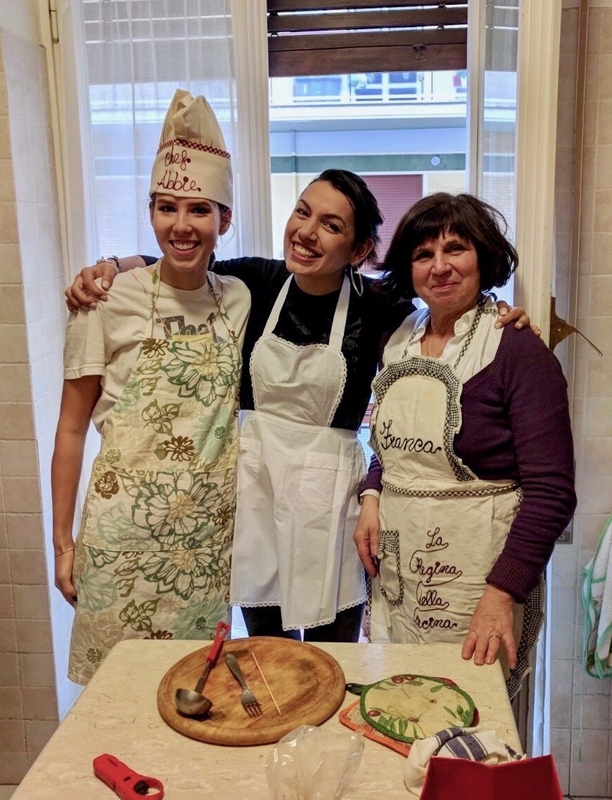 We’re getting quite good at splitting up the Thanksgiving duties and I’m so grateful that Edoardo’s mom, Franca, always makes the delicious turkey and so many other dishes for our lunch. Her food is one of my favorite things about living in this city. At this point, all I’m thinking about is Christmas. I think it’s because I wasn’t here last year but Rome during the holiday season is just stunning. Lights are already up, Christmas trees are being unboxed and I’m fitting in as many hot chocolates as my schedule allows (which is A LOT I’ll tell you). Last but not least, I’ve completely renovated my website and switched everything up! It’s the biggest reason why I haven’t been posting much because once I get it in my head that I want to change something, I’m really not fine with waiting or doing things half-way. I’ve done it all myself and I’ve taught myself plenty along the way. I’m so excited to see where this space goes and where I’ll want to take it in the future. It’s obviously just a personal project of mine and generates absolutely no income so it’s kind of nice just to do what I want with it. I enjoy having a place for the thousands of photos I take and to stay current with online design trends. The one thing I am having some issues with is striking a balance between work and my personal life because it feels like I’m always on social media. It’s hard to do something for work and then have the same excitement for it in your off-time as well. So far, it’s improving with clear boundaries and doing things for my blog/Instagram/etc. when I feel like it. What a novel concept. So thanks for sticking around if you have! I appreciate each and every view I get on this blog and have loved meeting new people through it. I’ll be back next week with an exciting post that different from anything else I’ve ever done on this blog, so watch out for it!